Today was our first visit to an American theme park together :) We were awake far too early, and yet still managed to leave after our “9am at the latest” decision! 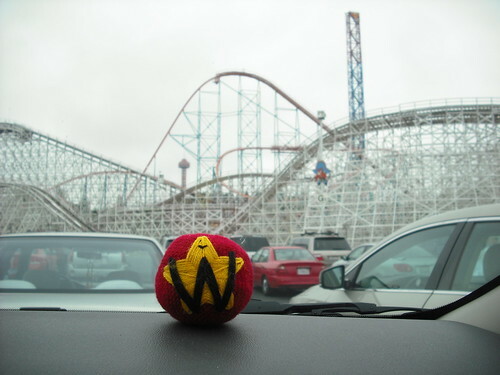 After stopping for fuel we made it to Six Flags Magic Mountain without too much difficulty, and collected our tickets. Then the day started to go downhill somewhat… our first stop was the Orient Express to get us up to Tatsu quickly… but it was closed. Okay, lets do Revolution since we’re next to it, but nope, that was broken down after a few minutes in that queue. Fine, let’s do X2 since that’s the big, exciting one with long queues and it was still very early and most of the school kids who seemed to be swarming the park had sounded terrified by it! RideHopper, the clever little app Chris has, told us that the queue time was 15 minutes. When we joined it looked like about 30-45 minutes but that was fine by us. This was a sucky way to start the day. Every one was totally fed up. They weren’t giving us any information, there was no indication of wait times, nothing to console us for the waste of a quarter of our day doing nothing. Most of the queue you couldn’t even see much of anything, so the wait felt even longer! The ride itself was pretty awesome! Not what we expected even from the few glimpses you get from the queue, and good fun. More curiosity than thrill as Chris put it. It was not, however, worth waiting over two hours for! We came off angry and grumpy at the waste of our morning and hunted out something to eat and drink. The cheeseburger was okay and started to help improve the day. Next up was Apocalypse. Here our grumpy moods returned as what we expected to be a 35 minute wait turned into 90! The queue looked reasonable, until you realised it was barely moving, and twice the length you could see! Seems they only had one coaster going, so it was managing about 22 people every 4 minutes… this doesn’t get many people through a ride! :( It was the only ride we went on which had any real theming to it, though that didn’t really make an appearance until you were almost at the ride, which was a shame. They could have done a better job of keeping us entertained in the queue if they’d interspersed the adverts on the TV screens with some of the videos we saw later on. 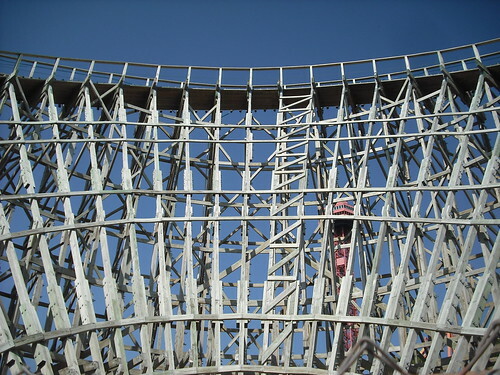 It was a good coaster, very fast for a wooden one :) But again, not really worth the amount of time stood still! Next up was Deja Vu, which we’d been watching whilst waiting for Apocalypse. The queue was much longer than the app told us again, but because we had a great view of the coaster the whole time, and the queue was actually moving, it didn’t feel so bad (apparently we were there 70 minutes, but didn’t feel so long!) This ride was awesome! :D Totally out of your seat, a fabulous loop, and then reversed! Beautiful views from the top, and great moments of suspense waiting for the drops. Finally there was some smiling and feeling like the day might improve. 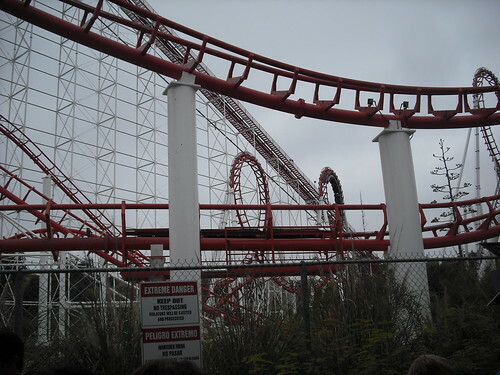 We went from that one over to Viper which I had spent most of the 2 hour queue for X2 looking longingly at, as it had many awesome looking loops :) A lovely short queue, and then into the back row. The ride was great, lovely loops and a corkscrew :) Unfortunately, the seats could do with some padding! It was very hard and we came off feeling very bashed and bruised! :( Ouchy! 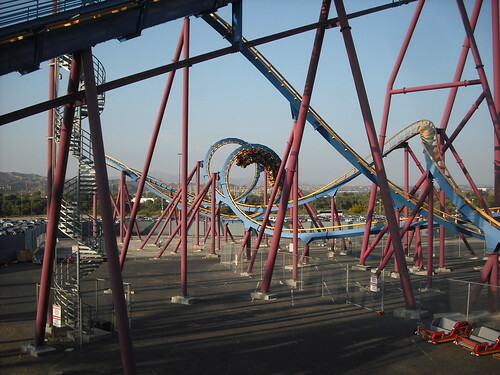 I feel a need to rant a little more about Magic Mountain… the rides are good. Very good infact! However, the general guest experience really isn’t. I know the filming screwed up our day more than a normal day (we’ve been checking ride times for weeks so we knew what to expect, and this wasn’t it!) They didn’t handle the filming well. They should have just closed the ride and let them film, then let us ride after, rather than having a whole lot of very angry guests stood in a line all morning! The queues were mostly very dull. There were a few boards of interesting facts on a couple of the rides, but these were infrequent. A number of the queues lacked much shade (quite thankful the day started rather dreary!) The toilets were not kept very clean. The churro machine was broken so they tempted me with the smell but wouldn’t sell me one! This entry was posted on Friday, June 17th, 2011 at 7:49 pm	and is filed under Rants, Vegas 2011. You can follow any responses to this entry through the RSS 2.0 feed. You can leave a response, or trackback from your own site. Well that sounds like you had some fun and some nasty long queues. I enjoyed reading about it and the dishes are still waiting! The blogs are great – thank you!